Ever wondered whether using essential oils for fibroids is a viable treatment method for dealing with these tumors and the resulting symptoms? Well, while studies on the effectiveness of using essential oils for specifically treating uterine fibroids are severely lacking, this does not mean that you shouldn’t look into whether essential oils can benefit your health or not. After all, essential oils have been used for thousands of years to treat various diseases and conditions naturally so why not fibroids? Before we get into whether essential oils can be used to treat uterine fibroids, we need to look at what exactly essential oils are because these are different from fragrance oils and perfumes. While they are called an oil, 100 percent essential oils which are the best to use shouldn’t feel oily to the touch. If they feel oily, they are of poor quality and contain other additives. Most essential oils are clear but certain types such as lemon, orange, patchouli, etc, may have a slight color to them. 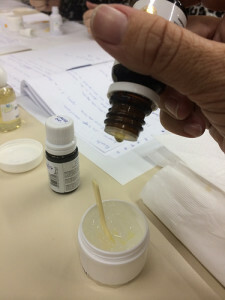 Essential oils are usually very potent and most of them (but not all) need to be diluted in a carrier oil such as olive oil, sweet almond, apricot kernel, grapeseed, castor, coconut oil, jojoba, etc, before they can be applied to the skin otherwise they will burn or irritate the skin. Essential oils represent the true essences of the plant they are derived from and the use of essential oils for healing dates back thousands of years when it was discovered that certain aromas can be healing for the body when the essential oil is inhaled (aromatherapy). There are also many physical benefits when essential oils (mixed with carrier oils) are applied to the skin especially during massage. No you won’t be able to drink essential oils and be magically cured of uterine fibroids. Please don’t drink any essential oils unless under the guidance of a naturopath because there are a few essential oils that may be ingested in small amounts. The way essential oils for fibroids work is indirectly. You need to look at some of the risk factors that may lead to the development of uterine fibroids and the following two in particular may benefit from essential oil application. It goes without saying that chronic stress is one of the risk factors for the development of various diseases and conditions including fibroid tumors. While not directly responsible for fibroids or any other disease, dealing with chronic stress day in and day out can weaken the body in various ways and leave you open to developing various diseases and conditions including fibroid tumors. Stress can also lead to hormone imbalance which is another risk factor for fibroid development when it results in a state of estrogen dominance in your body. Fibroids feed upon estrogen and an estrogen dominant state doesn’t only encourage the development of fibroids but also the worsening of symptoms of uterine fibroids. There are various essential oils that can be used to reduce or eliminate stress and they include but are not limited to lavender, various citrus oils, ylang ylang, Roman chamomile, frankincense, etc. Inhale the aroma in various ways (using an oil burner, a few drops added to bath water, a few drops applied to your pillow cases, etc) and you can also apply a drop or two of the oil (mixed with a carrier oil if you have sensitive skin) to the temples, ankles, bottoms of the feet, back of the neck, etc. If you are dealing with anger, despair, emotional pain, feelings of hopelessness and other deep wounds that are emotional in nature, you may want to use helichrysum essential oil. You can also mix it with other essential oils such as lavender, rose, geranium, Clary sage, etc. There are many ways to use helichrysum essential oil including massaging a few drops onto the temples or back of the neck for tension relief. Place a drop of this essential oil into the palm of the hand and rub the palms together and cup your palms over your mouth and nose to lift your spirits. Lastly, massage one drop of this essential oil over the heart center and solar plexus (area of the upper abdomen just below where the ribs separate) up to 3 times a day for inner strength and fortitude. As briefly discussed above, chronic stress can lead to hormone imbalance which is a situation when the body becomes estrogen dominant which is the perfect environment for fibroids to grow and worsen. But there are many other causes of estrogen dominance besides stress. If the root cause of your fibroids is estrogen dominance (discovered through blood or saliva tests) there are certain essential oils for fibroids which can work by promoting hormone balance. An important way that essential oils fight hormone imbalance and prevent estrogen dominance is by increasing levels of progesterone which is another hormone in the body. Two essential oils that can help accomplish this are thyme which can be used every day and oregano. Apply oregano oil to the bottoms of the feet. Phytoestrogens which are produced by various plants are chemically weaker than the estrogen that is produced by the body and the former can be used to help eliminate excessive estrogen produced by the body because they are able to bind to estrogen receptors. Phytoestrogens are preferred because the estrogen produced by the body is much stronger and more damaging than pyhtoestrogens which is why the latter are usually recommended for fighting an estrogen dominant state and promoting hormone balance. Certain essential oils such as basil, Clary sage, lavender, cypress, coriander, etc, contain phytoestrogens and they can be applied over the abdomen/pelvic region with or without a carrier oil. Always perform a patch test for skin sensitivity with or without a carrier oil. The oils that are most beneficial are the purest (organic, cold pressed, etc). For certified organic essential oils, carrier oils and herbs, click here. Don’t use essential oils excessively as this could lead to increased skin sensitivity. These are just a few tips on using essential oils for fibroids. Using essential oils works best and are the most effective as part of a comprehensive fibroid healing regimen. Create your own customized natural fibroid treatment regimen with the help of the scientifically proven Fibroids Miracle guide. Find out more about this powerful resource and how it can help you get rid of and prevent fibroids using natural methods only by clicking here. Next Top 5 Amazing Natural Remedies For Ovarian Cysts That Actually Work!